Place 1/3 cup red pepper, 1 tsp. jalapeño, 1/3 cup red onion, 1/3 cup tomatoes, 1/3 cup cucumber and 1 Tbls. cilantro in a medium bowl and set aside. In a food processor combine remaining ingredients, add tomato juice, olive oil, vinegar and lime juice, season with salt and pepper. 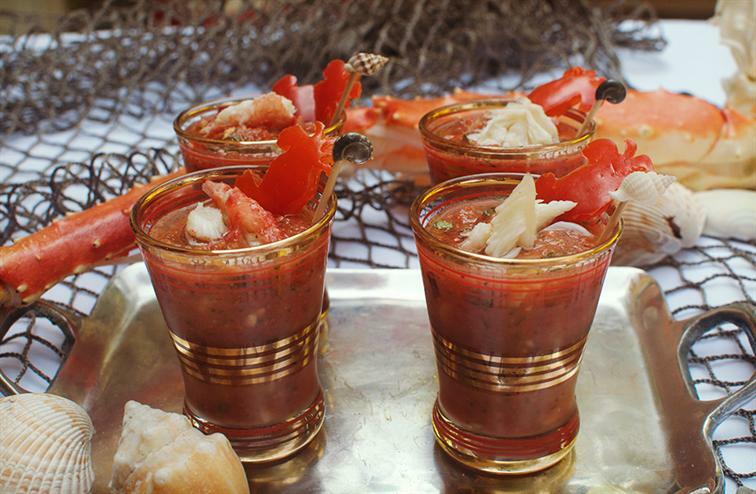 Process until smooth, remove and mix in reserved veggies and crab. Divide into glasses or bowls. Serve cold. Serves 6-8.